Changing residence is always complicated. You must inform friends and family about your new digs. Account information needs to be updated. Finding the best grocery store requires a lot of shopping around. But perhaps the most difficult task to accomplish is the one that involves your automobile. On a hot, steamy day in my new hometown of Clayton, Missouri, I thought that I had it all figured out. There were, at least so I was led to believe, two places to visit. One was the department that registers your car, and the other was the one where you transfer your license. After a preliminary check, it seemed that all the proper steps had been taken to ensure a trouble-free exchange of information. This seemed easier than I first imagined due to the fact that the two departments were right next to each other in a somewhat small building. Killing two birds looked very feasible. I found a good parking spot, locked the car, and headed in, clutching all the information that would speed me on my way. I suspected getting to the bureau before lunch was a good idea. Clayton has a booming business community, and perhaps some office workers would be headed toward the vehicle center during their break. Upon entering I noticed two of those number-assigning devices, the ones that require you to pull a tab and wait for your digits to appear on a little sign. Now I had to time it well. Few people were waiting to get their driver’s licenses either issued or renewed, and many seats in the registration division were unoccupied. I pulled numbers for both rooms and, with any luck, I would complete one round and get right into the second. Sure enough, I got called into the room where I would have my new identification issued. In my hand were the old Michigan license (one that contained yet another bad mugshot of my punim) and an insurance card proving that I could drive throughout Missouri and call the tow truck, as well as other pertinent information to establish proof of residency. The lone person behind the desk asked me to present my passport. Sure. I carry that on my person at all times. I had to tell her that I would return later with the proper document in hand. In the meantime, could I register the vehicle? Of course not. I never knew what that was or where to get it. 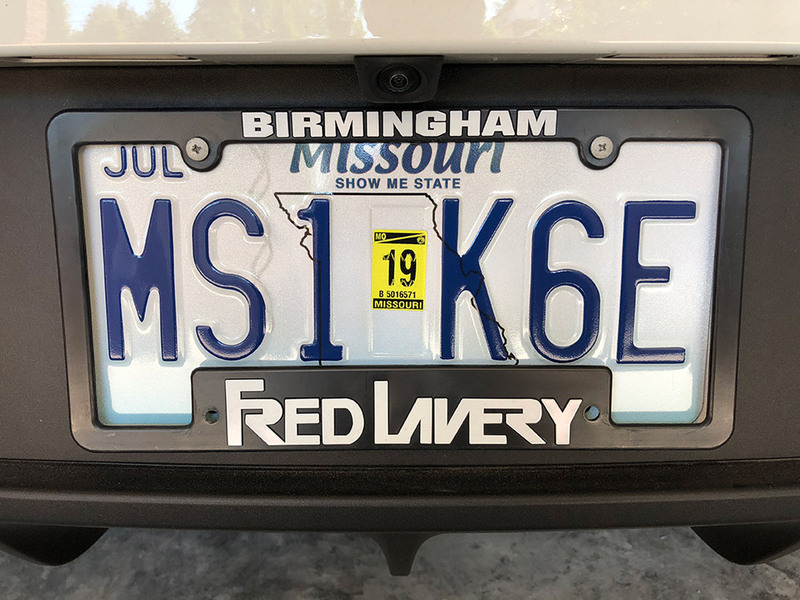 Apparently, this is needed for a person moving into Missouri from another state. It was my job to head to the tax office and get the proper form. I went back to the car, which had been sitting in the hot sun for almost an hour. The tax office was about a two-minute drive, and I considered walking, but it really was too warm for my liking. After that, I went home to retrieve the passport. Then I headed back to the DMV, but of course, my outstanding parking spot was now occupied. However, the lady in the license division was available. With all the official paperwork in hand, my path was now clear. A new picture was snapped, and I had a document that gave me a temporary identification. It was time to finish the process and get the car into the “Show Me State” rolls. However, it was well into the lunch hour at this point, and the waiting room had filled up. Taking another number from the machine, I patiently waited to be summoned. Finally, it was my turn. I confidently went up to the young man behind the counter. No passport was required for this, and with a shiny new car, there would be no need for an auto emissions test. Handing all the pertinent documents to the clerk, I just needed to be put into the Missouri system. “Did you have your odometer checked?” he asked. “The car is only a month old,” I responded. Now I was confused. What difference did it make as to how many miles are on the vehicle? “Where do I go to do that?” I asked. In this case, it was the auto dealership about five miles away. At least it did not take too long, and soon I was searching for yet another parking spot within striking distance of the vehicle office. Once more, with documents in hand, I went up to the clerk. No problems. Armed with my temporary license, proper documentation, and a new plate for the new car, I walked proudly to my carriage, praying that I would not have a parking ticket under the windshield wiper. But if that happened, I was sure that if I went back into the DMV, someone would gladly tell me where to go.